This book is perfect for any curious child who loves to take apart their toys, build a bridge out of books, or create their own system of pulleys and levers to open the bedroom door. 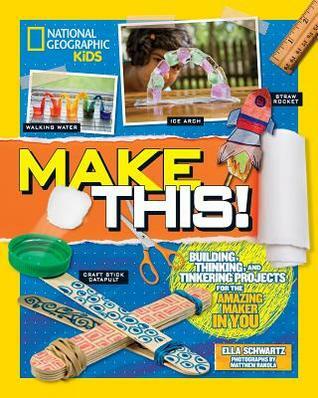 With special sections for materials, energy, optics, connecting systems, acoustics, and forces in motion, this book provides all the steps to create a rocket ship powered by your breath, make an entire rainforest ecosystem in a jar, and make a periscope out of cardboard, along with dozens of other projects. Each chapter also has questions to be solved and scenarios that require an imaginative solution. The colorful illustrations and photos make every page an enjoyment, drawing the reader in with the attractive pictures. The bite-sized information in the page layout is easy to read and understand. I enjoyed reading the factoids and explanations about real-life uses for simple scientific concepts, showing how the same engineering principles used in the simple projects are also applied in spacecraft, everyday technology, natural phenomena and wildlife, and in deep sea exploration. Since the book gives clear instructions with safety precautions, very few of the projects require an adult’s help, teaching children to explore on their own and use their imaginations, but also encouraging readers to ask for an adult’s help if needed. I’m going to give this book to my niece and do some of the projects with her! Disclaimer: I received a copy of this book in exchange for a free and honest review. All the opinions stated here are my own true thoughts, and are not influenced by anyone.